National figures released this week reveal that between 1st April 2017 and 31st March 2018, The Trussell Trust Foodbank network distributed 1,332,952 three-day emergency food supplies to people in crisis, a 13% increase on the previous year. In comparison, our own figures for the same period indicate that the Norwood and Brixton Foodbank distributed 9,809 food parcels, a staggering 22% increase. Mirroring the national picture, low income is the biggest and fastest growing reason for Foodbank use in our area. 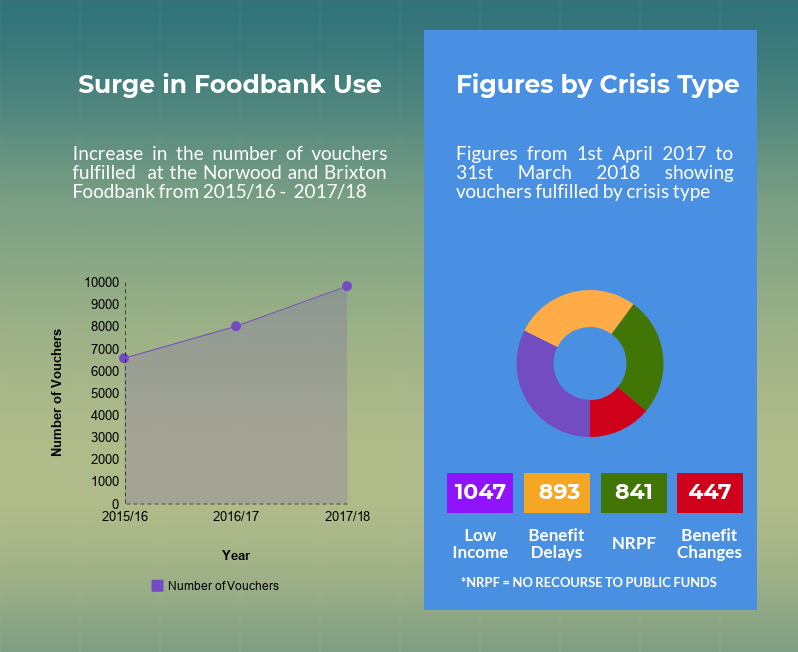 No recourse to public funds represents another significant factor contributing to the surge in the Norwood and Brixton Foodbank use.